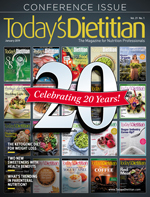 Dietitians have developed innovative ways to counsel clients in person and virtually. According to the National Eating Disorder Association, it's estimated that 20 million women and 10 million men in the United States are affected by an eating disorder at some point in their lives.1 As eating disorder specialists continue to learn and discover more about the illness, therapies for clients with eating disorders have started expanding beyond health care facilities and therapy chairs to include nontraditional, experiential approaches to treatment. Many dietitians are using experiential therapies that involve activities such as taking clients to restaurants to supervise meals and providing cooking therapy in clients' homes. RDs also are performing one-on-one and group therapy sessions in grocery stores by hosting in-person store tours and communicating with clients through FaceTime (the video-calling app on iPhones) and texting via smartphone. This article defines experiential therapy, describes how it's used, and focuses on its practice in grocery store settings. What Is Experiential Therapy and Why Use It? Experiential therapies enable clinicians to better connect with clients while observing and learning about their clients' reactions to certain situations.2 Experiential techniques are designed to enhance the clinician's awareness of the client's feelings and perceptions and typically require clients to take action. Examples include equine therapy; art therapy involving dance, writing, or drama; family therapy; or structured eating therapy. Dietitians also use experiential practices to gain a deeper understanding of the client's relationship with food; many involve eating with the client to discuss hunger cues and misconceptions or false beliefs about nutrition. Employing experiential therapy builds stronger bonds with clients, assists in earning clients' trust, and helps provide therapy better tailored to the individual client's needs. Practicing experiential therapy in the grocery store is gaining in popularity among dietitians. Therapy may take the form of store visits with a group of clients who have eating disorders or one-on-one store outings to address fears about choosing and purchasing food. Dietitians may walk down certain aisles to assess how clients react to certain foods, asking what aspects of the store gives clients anxiety and why, and learning how healthful messages on packaging influences purchasing behavior. Therapy also may entail teaching clients how to read Nutrition Facts panels and ingredient lists so they can purchase the most healthful food products. The goals of these store visits are to learn what clients are thinking about when visiting a grocery store, witness clients' reactions to being in the store, determine what food items they usually choose and why, and learn what misconceptions they have surrounding certain foods, aisles, or sections of the store, all the while providing education and counseling. "I love doing store tours because I get to see how they approach the store," says Kate Peters, MS, RD, LDN, owner of a private practice in Austin, Texas, who has worked with clients with eating disorders for almost 10 years. "Some of my clients avoid the grocery store because it can be overwhelming. I myself can get overwhelmed at the store, so imagine what it's like for someone who has different food beliefs." Stefanie Boone, MS, RD, CEDRD, owner of a private practice for 15 years in Santa Monica, California, and a contributing author of Real World Recovery: Intuitive Food Program Curriculum for the Treatment of Eating Disorders, agrees that experiential therapy in the grocery store is extremely helpful to both clients and dietitians. "The goal of the grocery outing for me as the clinician is to see what they go through in the grocery store. I get to learn about them and see where their anxiety increases and in turn teach them stress tolerance skills." Peters and Boone explain that they first noticed the need for experiential therapy in grocery stores while working at inpatient facilities. As clients moved from inpatient to outpatient status, they were handed grocery lists and tips, but most clients refused to go to the store because their anxiety was too great. "It was obvious that the store experience was something clients needed if they were going to be able to nourish themselves on the outside once they were done with treatment," Boone says. Peters says that when she worked at a treatment facility, she'd often perform experiential therapy in grocery stores in conjunction with meal challenges, a therapy that entails all clients eating a meal together. The group would first choose a meal to eat, create a grocery list, and then go to the store. At the store, Peters would break larger groups into smaller ones and send them on tasks. "In the store I would say, 'I want you to go to this aisle and pick out this ingredient.' When they came back with an ingredient, I'd ask questions about what they think they should get vs what they wanted to get and then address what they came back with," Peters says. Maiken Wiese, MS, RD, CDN, owner of a private practice in New York City, started practicing experiential therapy in grocery stores after participating in experiential cooking therapy with clients, which involved cooking meals with clients in their homes. "Some of them reported struggling in the grocery store, feeling paralyzed by all the options or compulsively distracted by nutrition labels," Wiese says. "My supervisor suggested we incorporate the grocery shopping into the cooking exposures to see what came up for the client and be a source of support." For most clinicians, experiential therapy in grocery stores starts in the office. Clinicians should first gauge clients' interest, noting that it may take several mentions before they feel ready to take on the challenge of a grocery store experience. Before therapy ever takes place in the grocery store, Boone, Peters, and Weise agree it's important to set goals with clients. "I have a worksheet that I have them fill out with me that asks certain prompting questions like, 'What do you hope to get out of this?' 'What's your biggest struggle?' 'What aisles do you get overwhelmed in the most?'" Boone says. Asking questions and setting goals helps prepare clients and allows them to feel in control of the experience. Peters and Weise prefer to make a shopping list with clients before the outing, while Boone prefers to focus less on making lists and more on the overall exposure to the store. Upon arrival at the grocery store, it's important to review the goals with the client. Boone and Weise suggest checking the client's anxiety level and facilitating breathing exercises or affirmations to put them at ease. Inside the store, each clinician will have personal opinions and preferences on what to discuss, but it's imperative that clients' needs remain the primary focus. Ask clients to identify a safe place in the store, or a designated area, that doesn't cause high anxiety. For many clients, the safe place may be the produce section. If anxiety gets too high, reassure them they can go to the safe place or leave the store. After reviewing goals and working to calm the client's anxiety, the experiential therapy continues as the client and dietitian walk through the different sections of the grocery store. RDs may educate clients on how to make healthful food choices and challenge irrational thoughts and misconceptions about food. Boone, Peters, and Wiese like to ask clients which parts of the store are most challenging and attempt to tackle the challenge by walking to the section and asking about their feelings, thoughts, and beliefs. "I had one client who used to freeze in the cereal aisle," Peters says. "We had a session where the goal was to go to the cereal section. When I asked her, what was going through her head, she said that there were certain cereals that looked good to her and others that she thought she should get instead. So, I asked, 'Do you think that food can fit?' If you want Lucky Charms, let's find a way for it to fit. You have to challenge the individual's nutrition thoughts and beliefs." Peters likes to emphasize the importance of making all foods fit and focuses on educating clients about wholesome foods. Boone says she likes to talk about an often-overlooked area—prepared foods. "A lot of clients think they should start with cooking, but I want them to have realistic expectations. First and foremost, you must get yourself fed. If it's not realistic for them to cook, I look at prepared options." If communicating one-on-one with clients or hosting grocery store visits isn't feasible or desirable, counseling clients virtually using the FaceTime app or through texting may be an option. Lois Zsarnay, LMFT, RD, CEDS, BCPC, owner of a private practice in Ventura, California, and clinical director of Bright Heart Health in San Ramon, California, engages in telehealth using these technologies to facilitate experiential therapy in grocery stores and many other settings. Zsarnay is both a dietitian and licensed marriage and family therapist with more than 30 years of experience working with patients with eating disorders. She started using telemedicine to counsel clients nearly eight years ago and searched for additional avenues that would benefit clients outside of traditional counseling settings such as offices. After brainstorming with coworkers, her team came up with the idea of using telehealth to counsel clients in the grocery store. "It's amazing when you start to think about it. Any place the client goes, I can be there and offer supportive words and help them to take a deep breath and give them some sense of anchoring and stability," Zsarnay says. The technology also enables Zsarnay to counsel clients in remote areas where sufficient care may not be available. Telehealth has helped Zsarnay, her team, and her clients experience a smoother transition from receiving intensive outpatient care, in which clients may require daily therapy, to outpatient care, in which clients see clinicians less frequently. Telehealth in the grocery store also helps clients gain independence, since the dietitian isn't present with them while they shop. Zsarnay says clients have a direct phone number to their assigned therapist and assigned dietitian in her practice and use this technology in grocery stores, restaurants, fitting rooms, and anywhere they may feel high anxiety. In the grocery store, clients wear earbuds and speak with the dietitian via FaceTime, which also is beneficial if the RD needs to see specific products. Zsarnay says it's ideal for clients to use FaceTime in the grocery store, but texting also is an option for those who are getting ready to discharge from outpatient treatment. Similar to the interaction between clients and dietitians during in-person grocery store tours, clients lead by expressing their struggles, feelings, and beliefs around food using FaceTime or in text messages, and the dietitian is there to challenge food beliefs or practice breathing exercises to calm anxiety. "The dietitian's role may be very didactic, teaching on reading labels, what fits, what doesn't fit; it may be emotional, helping them to stabilize and normalize eating; it may be talking about advertising on the front of a box vs what's on the Nutrition Facts panel; it may be about where things are on the shelf," Zsarnay says. "The session is dependent upon the goals of the client, which we discuss ahead of time." Of course, dietitians may be wondering whether experiential therapy in grocery stores, in person or virtually, is HIPAA compliant. The answer isn't clear cut. Peters says she has advised groups of clients she has counseled in the grocery store to say they were in a nutrition class for school if anyone asked what they were doing. She also says clients never arrived in a marked van and would remove nametags to ensure anonymity. To comply with HIPAA, Peters says RDs should make sure clients understand the risk, provide their consent to partake in the experiential therapy, and remain discreet during the outing. Zsarnay says clients understand they're giving their consent by using FaceTime and texting when being counseled in grocery stores or any public venue and have been educated on the risks of engaging in this type of therapy. She says she reminds clients to be discreet when talking on FaceTime in the grocery store, keeping in mind that surrounding shoppers may be able to hear what they're saying if they're talking too loud. "Since they have earbuds in, no one besides the client can hear what I'm saying," Zsarnay says. "We encourage them to be aware of what they're saying and since they are the client, they give consent." While there's no research on the impact of experiential therapy in grocery stores on clients with eating disorders, anecdotal evidence should encourage dietitians to adopt this in their own practice. Whether counseling clients in person or using telehealth technologies, experiential therapy in grocery stores can offer dietitians a deeper insight into their clients' food beliefs, triggers, and anxieties. Getting to know the client through the lens of the grocery store can help RDs become better clinicians and help clients work through the many challenges of shopping for healthful foods while overcoming an eating disorder. — Esther L. Ellis, MS, RD, LDN, is a retail dietitian and freelance writer based in New Orleans. 1. What are eating disorders? National Eating Disorders Association website. https://www.nationaleatingdisorders.org/what-are-eating-disorders. Accessed July 25, 2018. 2. Hornyak LM, Baker EK, eds. Experiential Therapies for Eating Disorders. New York, NY: The Guilford Press; 1989. "I usually start with a more structured meal plan because they can be so far disconnected from body cues, but the goal is to learn an intuitive and mindful approach," says Kate Peters, MS, RD, LDN, owner of a private practice in Austin, Texas, who has worked with clients with eating disorders for almost 10 years. Peters explains that her emphasis as the dietitian involves treating thoughts and behaviors associated with food. "To the client, autopilot is the eating disorder, and anything apart from that requires a lot of mindfulness and conscious actions. My role is to help guide them toward a healthy relationship with food and challenge health beliefs," Peters says. 1. Feeding and eating disorders. DSM Library website. https://dsm.psychiatryonline.org/doi/10.1176/appi.books.9780890425596.dsm10. Accessed July 26, 2018. 2. Classifying eating disorders — DSM-5. Eating Disorders Victoria website. https://www.eatingdisorders.org.au/eating-disorders/what-is-an-eating-disorder/classifying-eating-disorders/dsm-5. Updated November 25, 2016. Accessed July 26, 2018. 3. 6 common types of eating disorders (and their symptoms). Healthline website. https://www.healthline.com/nutrition/common-eating-disorders#section5. Published September 28, 2017. Accessed July 25, 2018. 4. The therapeutic team. National Eating Disorders Collaboration website. https://www.nedc.com.au/eating-disorders/treatment-and-recovery/the-thera/. Accessed July 25, 2018. 5. Outcomes and goals of eating disorder treatment. McCallum Place website. https://www.mccallumplace.com/goals-of-eating-disorder-treatment/. Accessed July 26, 2018. 6. The role of the registered dietitian/nutritionist on the eating disorder team. Eating Disorders Resource Catalogue website. https://www.edcatalogue.com/role-registered-dietitian-nutritionist-eating-disorder-team-2/. Published June 5, 2014. Accessed July 26, 2018.